Refined contemporary meets elegant traditional in this charming panel bed. The simple shapes and clean lines that give it its modern appearance are beautifully accented by box mitered insets and graceful crown moulding. It also features a detailed finish that gives it a distinct, classic feel to augment its elegant simplicity. 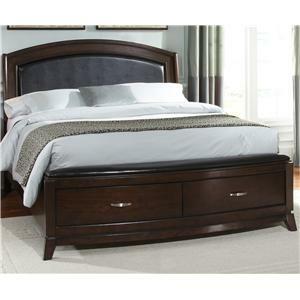 Give your bedroom a stunning transitional centerpiece with this lovely panel bed. The Transitional King Panel Bed with Wood Veneer by Stanley Furniture at Thornton Furniture in the Bowling Green, Alvaton, Glasgow, Scottsville, Franklin area. Product availability may vary. Contact us for the most current availability on this product. 042-13-353 King Pair Panel Bed Rails 1 82" 18"
042-13-145 King/California King Panel Headboard 1 83.875" 3.625" 67.875"
042-13-253 King/California King Panel Footboard 1 82.75" 3" 18"
Finish Polished Sable Finish. The multi-layered process begins with a cola-hued undertone topped with a black burnish. Next a stippling effect gives a tortoise shell appearance to each piece. Finally, English paste wax completes the process for a detailed and intense finish. Drawer / Shelf Construction Drawers are constructed with interlocking dovetail joints (front and back) for max strength. Selected hardwood drawer sides, backs, bottoms. Durable dust panels between drawers and drawer bottoms held rigidly in grooves. Drawer interiors sanded & sealed. the drawers of each piece are fully lined with cedar, an aromatic flourish that protects your items. Case Construction Mortise and tenon joint construction. Durable dust panels between drawers provide extra structure and seal each unit. Back panels/Case backs are recessed into ends. They fit well and are smoothly finished. 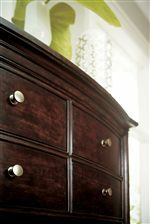 Constructed of select hardwood solids; acacia veneers; simulated wood components. Elegant simplicity is blended effortlessly with timeless artisan craftsmanship in the Classic Portfolio's Transitional bedroom collection. Each piece features clean, smooth lines and shapes, giving them a distinct contemporary sophistication. 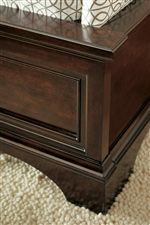 This is beautifully accented by the intricate details found throughout the set that provide each piece with a semblance of distinguished tradition. 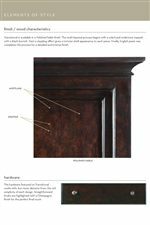 Exquisite crown moulding, Champagne-finished knob hardware, and bow fronts adorn the charming acacia veneers, but never detract from the stunning Polished Sable or Estonian Grey finishes. 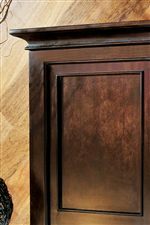 A rich brown undertone is topped with a black burnish forming a lovely hue that is brilliantly augmented with mottling and spatter detailing, giving each of the pieces an elaborate, classic appearance to complement their refined, contemporary facades. This delightful combination of styles can beautifully accent any bedroom. The Transitional collection is a great option if you are looking for Transitional furniture in the Bowling Green, Alvaton, Glasgow, Scottsville, Franklin area.